Challenge yourself and Do Something Different! 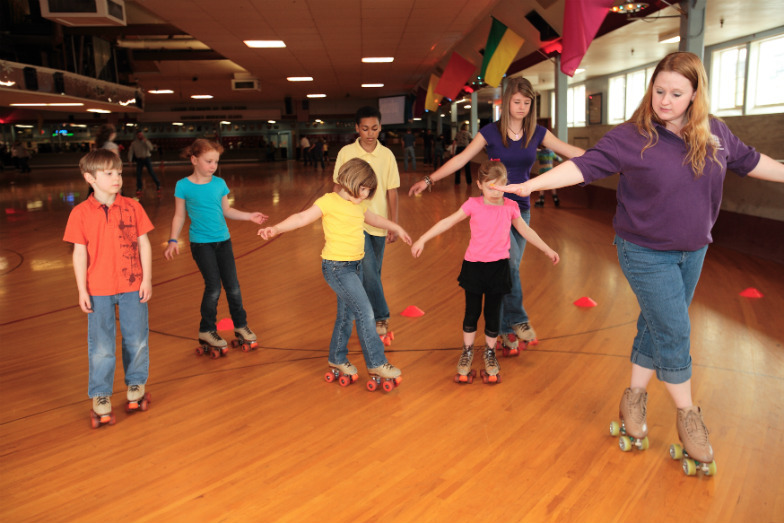 Roller skating lessons are the perfect place to stay fit, active and healthy, so why not get a new skill with some 'Learn to Roller Skate' lessons? The lessons are open to all ages and suitable for beginners and competent skaters who wish to improve their skills and though we specialise in Quad Skating, we can adapt our lesson plans for inline skates too. Skating is great fun for all the family and you'll be in good hands with tuition provided by BRSF (British Roller Sport Federation) accredited instructors. The lessons have been carefully designed to include a variety of skate disciplines so that once you're training is complete, you can move on to Jam Skating, Artistic or roller hockey. Roller Skating is fast becoming a common hobby around the world and requires informed decisions when it comes to buying skates and safety equipment. During our roller skate lessons we make sure that you'll have tips to take away with you so you can practice in your own spare time. A new addition to our lessons we are looking at introducing is the option of having video analysis of your skating techniques so you can see exactly what you need to work on- this will be rolled out very soon. Our Roller Skating lessons are fun. Doing it with friends or in a group is great for Learning, but we can cater for private lessons! Whichever option you decide we'll make sure you're in a safe environment and will guide you every step of the way to becoming a confident, capable skater so you get the most out of the experience and enjoy every minute - once you complete the course you'll want to explore the Wonderful World of Roller Skating! You'll also get some handy tips to help you make the most of your skating and avoid possible pitfalls. The lessons are taught by a British Roller Sport Federation (BRSF) qualified skate instructor.